Distillery chooses to treat wastewater using aerobic treatment in XR-5 lined ponds. The beginning of the distillery process for rum manufacturing requires quantities of high quality water. 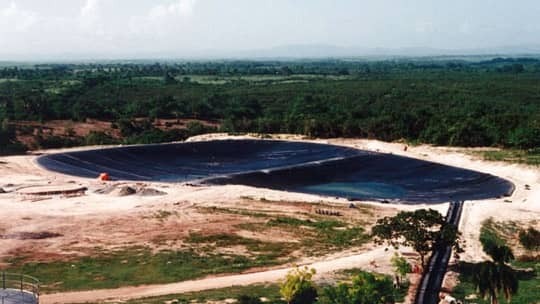 In the case of Barcelo Distilleries in the Dominican Republic, that water comes from groundwater, the quality of which must be preserved. Barcelo chose to treat their wastewater using aerobic treatment in XR-5 lined ponds. The two-stage treatment process employs a flow and temperature equalization stage followed by a higher oxygen level stage. The wastewater enters the first impoundment through an XR-5 lined ditch (lower right foreground). XR-5 was the material of choice in this application due to its resistance to high temperatures, alcohol compounds, and thermal expansion-contraction. Additionally, the rugged XR-5 resisted the rocky subgrade at the site. Approximately 225,000 square feet of 8130 XR-5 is in service at this site.